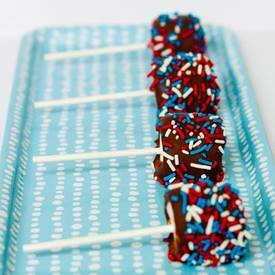 4th of july chocolate pb marshmallow pops! What are you guys doing to celebrate the 4th of July? Before we are off to enjoy our long weekend, here’s my sweet treat plug for the holiday. I love these Festive marshmallow pops for a few reasons…. 1) The mallows are covered in chocolate and peanut butter and sprinkles. Score. 2) They can be made ahead of time (like today or tomorrow) and refrigerated until ready to serve. 3) They are a quick and easy treat the kids will love to help with! 4) You don’t need to heat up the house on that hawwttt 4th of July Day with an oven. Amen to that. There’s a good chance you already have the items needed to make these. But if not, run and grab some sucker sticks, marshmallows, milk chocolate chips, white chocolate chips, and Patriotic Red, White, and Blue Sprinkles. Ready, Go!